My wife, DyAnne, and I just finished our annual Northern Exposure party. It’s a weekend-long affair that began as a single-day event with family when the series was in its heyday. Basically, we turn on the TV, crank up our old VHS and watch episodes of choice one after the other. Back in the day, we’d also dress up as favorite characters and put on a monster feast with recipes from its spin-off cookbook. We still maintain the culinary overload. When the show first aired 28 years ago, it grabbed us immediately. Somehow, voices through the realms told us, “You’ll want to tape these.” We didn’t argue. While there’s no telling how long those VHS cassettes will hold out, we recorded every episode on its original broadcast date beginning with the third show. Eventually, we collected them all, but we prefer watching the originals for a lot of reasons. Many include the commercials that ran with them. Though we left some commercials out, we’re reminded of products and styles that were all the rage at the time. They feature some timeless people, too. What a treat to still hear Willie Nelson sing about “the woman with the rose tattoo” for Taco Bell. When we first moved to Ely, Minnesota, we heard the stories that the town was the real-life prototype for the fictitious Cicely, Alaska, where Northern Exposure takes place. We weren’t aware of that at the time and perhaps that could still use some fact-checking. 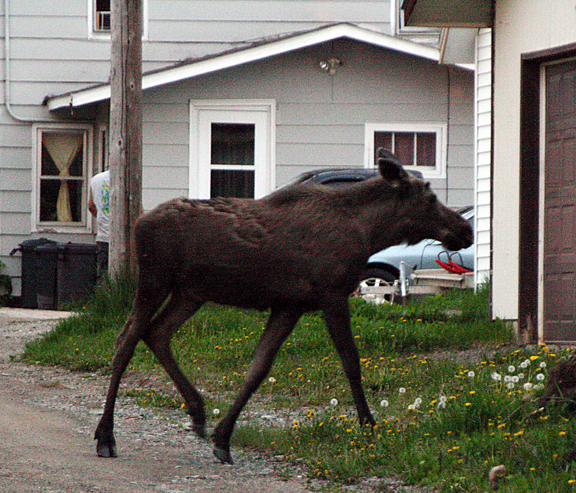 But the similarities between the personalities and lifestyle here, and those in Northern Exposure are darn near spooky, complete with an occasional moose sauntering through town. I took the attached photo around dusk one Labor Day. There’s a guy with his back to the moose behind the phone pole to the left. I always wondered about his reaction if he turned and suddenly saw it. Would he go legless or just utter, “Yeah, I suppose”? Fiction comes from somewhere and it’s usually reality. As Dy and I watch the episodes, we catch ourselves saying things like, “He looks like the guy at the Forest Service,” “Doesn’t she remind you of the watercolor artist from the reservation,” or, “He’s the geologist over by Little Gabbro portage?” But there’s more to it than physical attributes. While their conflicts and quirks are abundant, Northern Exposure characters accept each other in heartwarming ways. And it’s not exclusive to small-town life. That acceptance resides in the microcosms of suburbia and big-city neighborhoods. We laugh even when we know the jokes are coming. Sometimes we well-up at the tear-jerker scenes even when episode-repetition might have otherwise made us callous. To this day, we’re still caught unexpectedly by something we never regarded before. All of it triggers conversation that makes us look at the interior of our lives and what helped us reach this point in time. It’s a recognition that those pretend lives are as real as the folks next door.